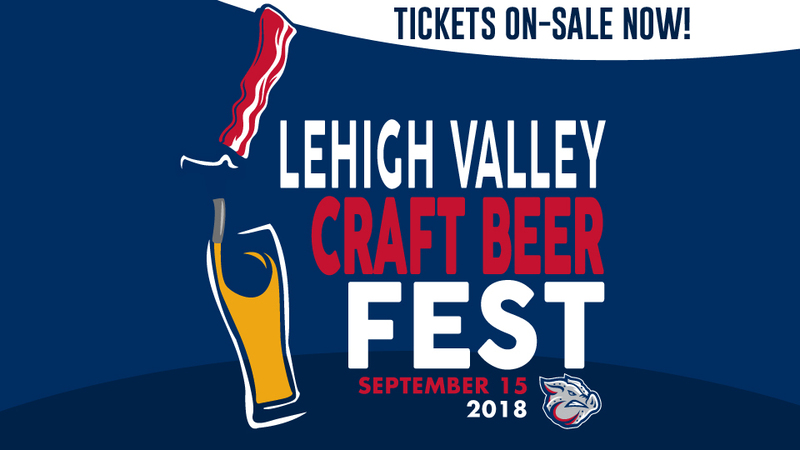 The Lehigh Valley Craft Beer Festival - an annual event featuring unlimited tastings of regional craft beers- will return to Coca-Cola Park on Saturday, Sept. 15 from 3-6 p.m.
More than two dozen breweries attended last year's event including Weyerbacher Brewing Co., Troegs Brewing Co., Shipyard Brewing and Fegley's Brew Works. Visit CocaColaParkEvents.com and keep an eye on our social channels for updates on this year's list of breweries. Among the food trucks confirmed for this year's event are Atomic Hog, Bull & Bear, Clubhouse Grille, Gnaw Jaw, Greek Street, Grumpy's BBQ, Nuts for You The Sweet Lush Cupcake Camper. To purchase tickets for the Lehigh Valley Craft Beer Festival, click here, visit CocaColaParkEvents.com, call (610) 841-PIGS (7447) or visit the Coca-Cola Park ticket office during normal business hours (Mon.-Fri. 9 a.m. to 5 p.m.; Sat., 10 a.m. to 2 p.m.). The total number of participants will be limited for this event so act now to guarantee your tickets. Nearly 2,000 guests attend the festival each fall. Parking is free for the Lehigh Valley Craft Beer Festival. Open since 2008, Coca-Cola Park is widely regarded as one of Minor League Baseball's premier venues. In addition to serving as the home for the Philadelphia Phillies Triple-A affiliate, the Lehigh Valley IronPigs, Coca-Cola Park has also hosted a wide array of events since its debut. Book your next event at Coca-Cola Park by calling (610) 841-1214. For directions to Coca-Cola Park, please visit ironpigsbaseball.com. Attendees are reminded that there are three entry points for parking and are encouraged to use the Dauphin Street entrance when traveling from downtown Allentown. In addition to the Dauphin Street entrance, entry to Coca-Cola Park can be gained off American Parkway and Union Boulevard. Preferred/Handicapped Parking access is available via American Parkway only.